Elgintime - What are Elgin's Grade, Class and Model Designations? ModelIn each Elgin movement size, there are several model numbers. 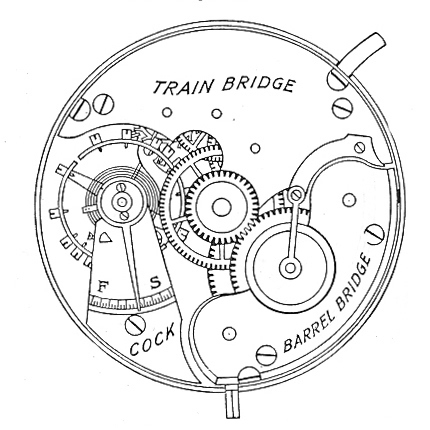 The model numbers refer to the basic design, such as the type of plates, open-face or hunter case movement, etc. Model numbers are unrelated across watch sizes (two watches of different sizes that are both model 8 have no connection to each other). The same model numbers are re-used across movement grades and classes.ClassThe class groups grades by general quality, materials and finishes. There would be several grades with class 91 for example, which would each be made with a similar finish, use of gold or brass, blued screws or not, and other details. To my knowledge, Elgin stopped using the model and class designations in 1914.GradeThe watch grade is more widely documented, and best defines the watch. The grade is most useful in looking up the specific replacement parts.All of these numbers, model, class and grade, have no general organizing principle. They were assigned by Elgin sequentially over time, as the products were created. There is nothing to say that one is "better" than another because the number is higher or lower.